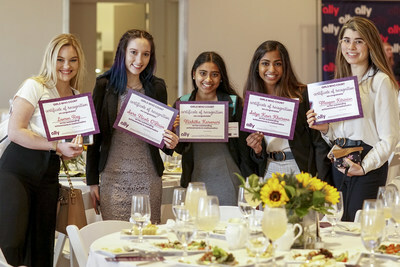 Ally Celebrates Pi Day with 100 Charlotte High School \"Girls Who Count\"
CHARLOTTE, N.C., March 15, 2019 /PRNewswire/ -- In celebration of National Pi Day, the annual holiday of mathematicians everywhere, Ally Financial held a special "Girls Who Count" luncheon honoring 100 high school female "mathletes" from across the Charlotte-Mecklenburg (North Carolina) public, private, and charter schools. The March 14th event held at Charlotte's Mint Museum Uptown recognized high school girls who have shown a special enthusiasm and aptitude for mathematics. "At Ally, we firmly believe it's our responsibility as corporate citizens to make a positive impact in the communities where we work and live," said Diane Morais, President, Consumer & Commercial Banking Products, Ally Bank. "The Girls Who Count celebration is Ally's way of encouraging these young women to continue pursuing their passion for math and developing their skills so they'll be ready to explore multiple career paths and take control of their financial futures." In addition to being hosted by more than 25 of Ally's female leaders, the math students were treated to inspirational remarks from Katherine Goble Moore, the daughter of Katherine Johnson, the NASA mathematician made famous in the movie Hidden Figures, as well as other honored guests. Ms. Moore shared a special message to the students from her mother: "If you are persistent and follow your dreams, the sky's the limit."